This year, we’re bringing dessert to our family’s Thanksgiving dinner and it just happens to be dessert week on Bon Appetite! Perfect timing, right?! While I thought I had already made my mind up about what I was making (a fig balsamic cheesecake), this list of desserts above is throwing me for a loop! Pecan, bourbon and butterscotch bread pudding?! Brown butter apple tart?!!! Looks like I have an important decision to make. How about you? Are you in charge of a dish this year? Are you hosting an entire Thanksgiving dinner? (you’re more brave than me) I’d love to know! Oh, thanks! I use photoshop for my layouts. Ooooh yes, that cheesecake looks amazing! I’ve never thought of using greek yogurt. Hosting the whole shebang, although people are bringing some side dishes. We’re going more traditional and doing apple pie and my friend is bringing some sort of pumpkin dessert. This is my 3rd (maybe 4th) time hosting a holiday and it’s getting easier. Although it takes a TON of prep work and planning. Wow Carmel, bravo to you! Apple pie and Pumpkin anything are always my favorites too! Good luck with all of the preparations! 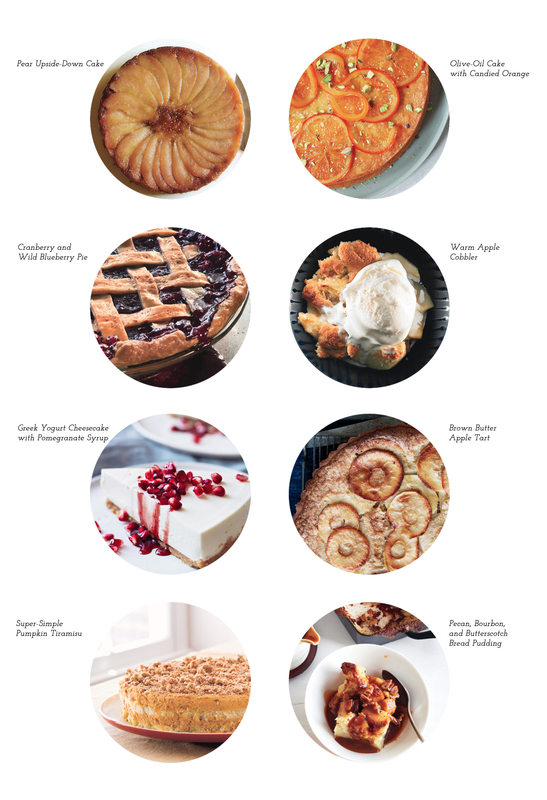 That pear upside down cake looks SO yummy! I’m bringing a dessert for Thanksgiving – my husband’s grandmother’s apple pie recipe. She passed away two Thanksgivings ago, and we all miss her terribly. Oh, so sorry to hear about your husband’s grandmother but what a wonderful way to celebrate her each year. Apple pie is the best! I’m drooling! This looks unreal. Can’t wait to feast on Thanksgiving.